Project approved after height was further reduced by eight feet. 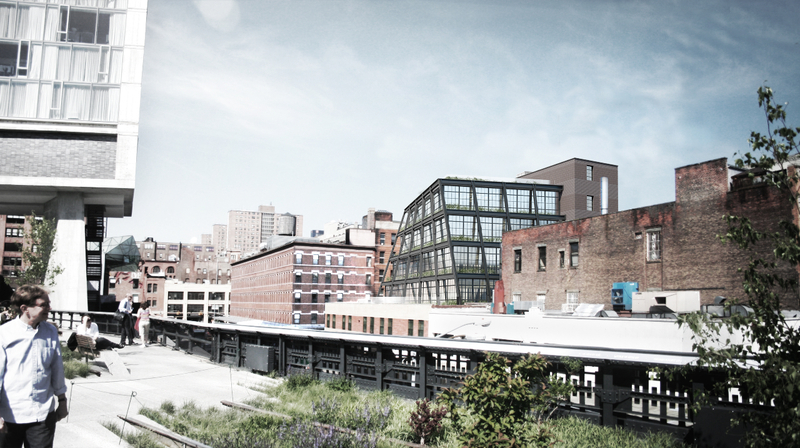 On July 19, 2011, Landmarks approved Taconic Investment Partners’ revised proposal to build a four-story addition above a low-rise Moderne-style building across the street from the High Line at 837 Washington Street in the Gansevoort Market Historic District. Taconic first proposed a seven-story addition in November 2010, which it then reduced and resubmitted to Landmarks in April of 2011. The Commissioners generally praised the Morris Adjmi-designed torqued glass and steel tower, but expressed reservations about approving such a large and visible addition to a contributing building in a historic district. 8 CityLand 62 (May 15, 2011). At a June meeting, Taconic presented a plan nearly identical in design to the previous iteration, but with floor heights reduced to create a building eight feet shorter than the prior proposal. Architectural consultant Bill Higgins explained that the vertical steel beams would now be visible through the storefronts of the existing building, which demonstrated the interplay between the new addition and existing building. Commissioners Libby Ryan and Michael Devonshire voted against approval. Ryan said that while the design would be exciting, she believed it would be inappropriate to add four-stories to a contributing building. Devonshire would have supported the proposal if it had been one story shorter, but believed that the current plan was like adding a “ten-gallon hat” to the building. LPC: 837 Washington St., Manhattan (11-3143) (July 19, 2011) (Architect: Morris Adjmi Architects).